See how just a few extra dollars turbo charges your wow-factor! We all get stuck in a wine rut now and then, drinking the same old favourites. But one of the best things ever is stumbling across a wine you’ve never tried before, and going, ‘well, hello!’. We’ve found 6 beauties and paired them with 6 classic Angel faves in a case which is juuuust right. That means you can sample some exciting newbies without taking a complete punt! One of the best parts of our job is finding those wines for you. We're always asking winemakers, what’s the next big thing? What grapes are trending? What new styles would make Angels go, ‘ooh, hello!’? Sam's ever popular Chardonnay is back! With only a touch of oak treatment, each sip packs plenty of fruit and a soft lingering finish. A tried and tested Angel favourite, this will not only send Chardonnay lovers in to a spin, but it's light, modern style is the perfect mid-ground for those who typically avoid Chardonnay. Dip your toe in to this wonderful world! 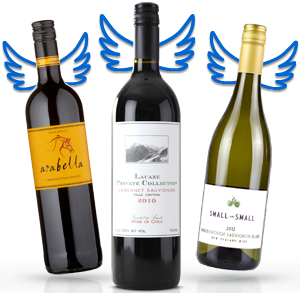 At under $9 per bottle for Angels, don't sell you cellar short! Stock up on this crowd pleasing drop and revel in it's tantalising aromas, all made possible by your Angel backing. The latest vintage of Jen's classic Rebel Sauvignon Blanc is here! Fresh and fragrant, kiwi fruit and citrus aromas will dance around around as you pour each glass. The palate is zippy and refreshing and all too easy to drink! Jen had never made a Sauvignon Blanc until Naked came along. Now with access to quality fruit and overwhelming positive feedback last vintage from Angels, she hasn't looked back! 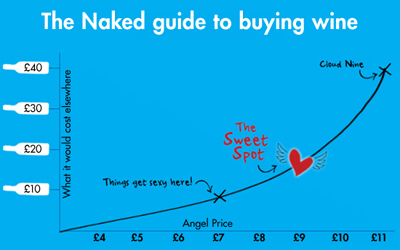 With consistent buy-again Angel ratings of 90% or above, and at a bargain Angel price under $9, any white lover would be jumping for joy at the sight of this gem! Why not pop a few in your case and have those impromptu weeknight splash outs with friends and family covered?